Mount Ranier National Park. Established in 1899, the Park contains 235,625 acres, of which 97% are designated Wilderness. 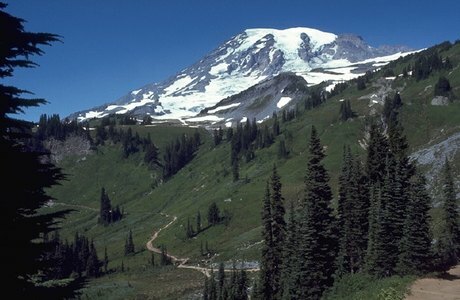 Includes Mount Rainier, at 14,410' elevation, an active volcano encased in over 35 square miles of snow and ice. The park contains outstanding examples of old growth forests and subalpine meadows. Designated a National Historic Landmark District in 1997 as a showcase for the "NPS Rustic" style architecture of the 1920s and 1930s. Whether hiking on its flanks, climbing its summit, snowshoeing or cross-country skiing on its slopes, camping along its glacier-fed rivers, photographing wildflower displays in subalpine meadows, or just admiring the view, nearly two million people come to enjoy the grandeur and beauty of Mount Rainier each year.